GC Cooks: Tailgate Queso Dip | Grand Central Magazine | Your Campus. Your Story. Football season is here, Chips, and if you aren’t a huge fan of the sport itself, then how about try the foods that come with it? 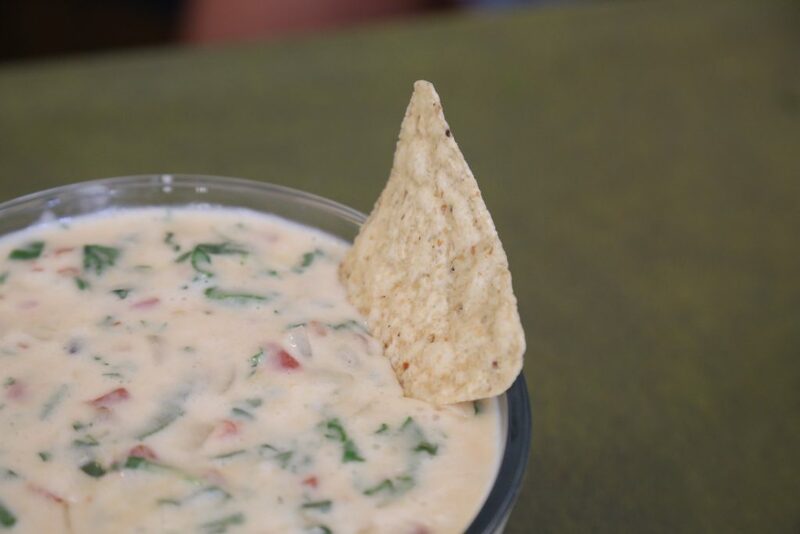 Next tailgate that you attend, show your “food spirit” by bringing this savory two-in-one white spinach queso dip. It only takes 25 minutes to make and about 5 minutes devour. In a large skillet, heat oil over medium heat. Add the onion and jalapeño, saute until tender. Add cheeses and milk. Stir until melted, be sure not to scald the mixture. Then, add tomatoes, spinach and cilantro. Stir well. Pour into a dish to serve right away, or use a crock pot on the “keep warm” setting to bring to a tailgate and share with friends! Serve with tortilla chips. Separator image Posted in Archives, Drinks, Food, Food & Beverage, Recipes and tagged with Anne Langan, beverage, cheese, Dip, Food, football, friends, Kelsey Wooten, queso, Share, social, tailgate.